These unique glitter taper candles will delight you with their festive sparkle and elegant design. Exquisite for gifts and decor for any occasion year-round. Natural white beeswax rose tapers adorned with your choice of silver or gold wax paint & glitter edging. Your choice of 3 to 6 tapers, in either 6" or 8" height. I handcraft the glitter rose tapers to complement each other. No two candles look exactly the same. Please contact me for pricing if you'd like a larger quantity or different sizes/colors than available in this listing. Handcrafted at my art studio in California. 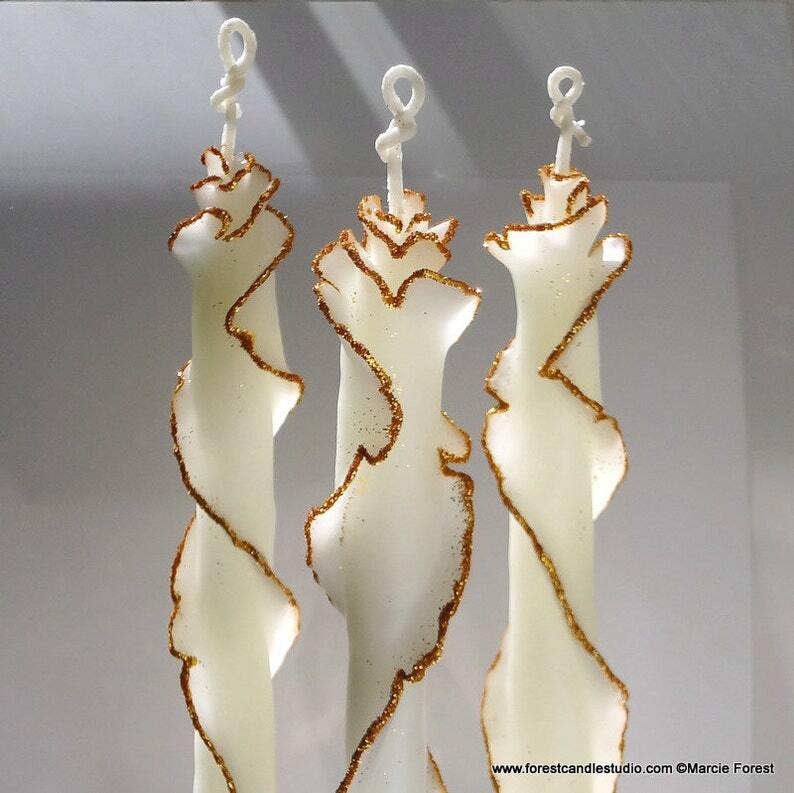 Since each candle is individually hand-built by shaping and dipping the delicate layers, the sizes will vary slightly. Your tapers will be packed all together in either kozo hemp lace paper or a gift box (depending on how many tapers are ordered). The current estimated production time for this item is listed in the "Shipping & Policies" tab. Need the candles by a specific date, or sooner than what's listed? Contact me prior to purchase to confirm. Rush orders accommodated when possible (there may be an additional charge). In my signature packaging: a white gift box tied with tulle ribbon. A Forest Candle Studio mini note card is enclosed (candle info & burning instructions are on the back). Click the "Shipping & Policies" tab to see PAYMENT & SHIPPING INFO for this item, and my general SHOP POLICIES. Same as I said about my big candle they something everyone would love for your home or a gift.